AUGUSTA — Westbrook starting pitcher Zack Bean pitched a complete game shutout and beat out a potential double play to allow the winning run to score in the sixth inning as the Blue Blazes beat Messalonskee 2-0 in the Class A state championship game at Morton Field on Saturday. AUGUSTA — Messalonskee’s Patrick Breton and Westbrook’s Zack Bean were engaged in a pitchers’ duel in the sixth inning of the Class A baseball state championship game Saturday at Morton Field. It was a play Bean made with his legs, not his arm, that ended the Eagles’ reign as state champs. Bean beat out a double-play ball that would have ended the top of the sixth inning, but instead allowed the go-ahead run to score, and the Blue Blazes added an insurance run in the seventh inning to win their first Class A state title with a 2-0 win. Westbrook finishes its season at 17-3. The loss ends a second straight hot streak in the playoffs for Messalonskee. The Eagles entered the playoffs 10-6 before upsetting Bangor, Hampden and Brewer on their way to the state title game. 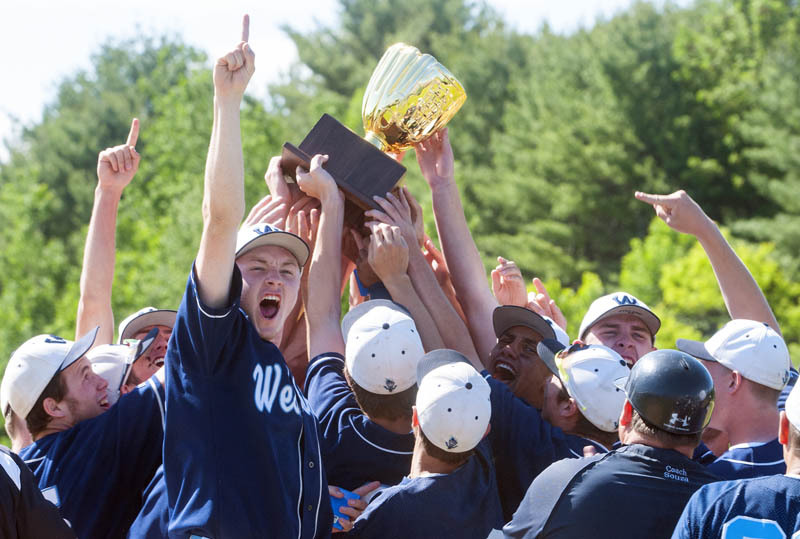 Last spring, Messalonskee was 5-5 before running off a 10-game winning streak and winning the Class A state title. “The last two years we came together as a team during the playoffs,” Breton said. The fact that Breton was still pitching in the sixth was a surprise, considering Messalonskee has used a host of pitchers in each of its playoff games. Messalonskee coach Ray Bernier said the decision to stick with Breton was done on an inning-by-inning bases, though Breton said he asked Bernier before the game if he got into a groove, to let him keep going. Breton worked out of trouble in the first inning then got in a groove, shutting Westbrook down until the sixth. In the first, he walked two batters and gave up a hit, but allowed just two base runners after that until the sixth inning. In the sixth, Ryan Gilligan led off with his third walk of the game and moved to second on a single by Kyle Heath. Keenan Lowe sacrificed both runners up and the Eagles elected to intentionally walk Derek Bouchard to load the bases with one out. Bean, Westbrook’s No. 6 hitter, hit a slow roller to Messalonskee second baseman Jake Dexter. Dexter fed shortstop Jared Cunningham for the out at second, but Bean just beat Cunningham’s throw at first to allow Gilligan to score. Westbrook tacked on a run in the seventh inning when Kaleb Kent singled off Messalonskee reliever Devin Warren, stole second, moved to third on a wild pitch and ground ball by Collin Joyce. Bean, meanwhile, didn’t allow a Messalonskee runner past second base and didn’t allow a batter past first after the third inning. The Blazes turned three double plays behind him and cut down three runners on the base paths. Bean allowed four hits, walked one, hit one and didn’t record a strike out. “He pounds the zone and we made plays behind him,” Westbrook coach Greg Souza said.